(Nanowerk News) Scientists at the A*STAR Institute of Bioengineering and Nanotechnology have developed a green catalytic cycle that could help solve some of the world’s biggest challenges—global warming and renewable energy. Carbon dioxide (CO2) is a major factor in global warming and the b?te noire of climate change scientists. But if scientists at the A*STAR have any say in the matter, it could soon be turned into useful energy in a simple, inexpensive and eco-friendly way. A team at the Institute of Bioengineering and Nanotechnology (IBN) led by principal researcher Yugen Zhang has invented a method for converting CO2 to into methanol (CH3OH) using an organocatalyst system based on a class of compounds called N-heterocyclic carbenes (NHC). In recent years, demands for alternative energy sources to replace fossil fuels have been growing against the backdrop of rising concern about climate change, and methanol has great potential in the alternative energy arena as a biofuel. “CO2 is a major greenhouse gas and a major cause for global warming. The energy crisis is also an urgent issue to tackle. If we can convert CO2 to energy in a cost-effective manner, it would solve two problems in one shot. That is the motivation of our research,” says Zhang. 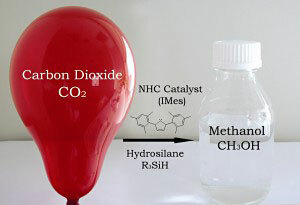 Fig.1: The team at the IBN has invented a green catalytic cycle to turn carbon dioxide into methanol. From right: Siti Nurhanna Riduan, Yugen Zhang and Jackie Y. Ying. Organocatalysts have been known for a long time, but only in recent years has the technology once again come under the spotlight. When Zhang joined the IBN in 2004, organocatalysis was still a newly rediscovered research field. His first work was on immobilizing organocatalysts on solid supports to improve their usability, but he also succeeded in developing a number of novel polymeric organocatalysts. This prompted him to shift his research focus toward the development of new organocatalytic reactions for organic and pharmaceuticals syntheses—including CO2 fixation and utilization. In 2009, Zhang published a paper ("Conversion of Carbon Dioxide into Methanol with Silanes over N-Heterocyclic Carbene Catalysts") in collaboration with Jackie Y. Ying, professor and executive director of the IBN, and Siti Nurhanna Riduan, an IBN senior lab officer (Fig. 1), which attracted much attention from both the scientific community and industry. Carbon dioxide is highly stable and difficult to break down, and many researchers and companies have examined systems employing metal catalysts in combination with suitable reductants such as hydrogen gas (H2) to convert it to other products. However, these efforts have been plagued with problems associated with the catalyst’s short usable life, its susceptibility to degradation by oxygen, and the huge amounts of energy required to reach the high temperatures and pressures needed for the reactions to proceed. On the other hand, most organocatalysts, as Zhang points out, are tolerant of oxygen and active at room temperature and moderate pressures. “Because we have selected the right catalyst and the right system, we can make the reaction happen under mild conditions,” he says. NHCs have been known to chemists for some time and in recent years have become well-established as organocatalysts and ligands in organic synthesis. Zhang’s team used the NHC catalyst to activate and fix CO2, and then added a silicon-containing substrate called hydrosilane to reduce the activated CO2 (Fig. 2). Fig. 2: Hydrosilane is key to reducing the activated carbon dioxide to methanol, but Zhang is now searching for less-expensive alternatives such as hydrogen gas. In their reaction, about 50% of the hydrogen in the hydrosilane is converted to methoxide in 90 minutes. Methanol is then obtained by hydrolysis in 90% yield after just 16 hours. Under ambient conditions, one molecule of NHC catalyzed 1,840 reactions before becoming inactive, converting about 25.5 molecules of methanol per hour. These figures are about 20 and 50 times better than those for other common organometallic catalysts such as zirconium-based catalysts. “The results prove that NHCs are more efficient catalysts for this reaction than transition-metal catalysts, which require weeks to afford the final reduction products,” Zhang says. But the superior performance of the NHC catalyst system is not just of academic interest—the team has already patented the technology and developed a recyclable catalyst for the reaction, and is now in talks with a number of companies toward co-developing the technology. Despite the promising results so far, many obstacles still remain to be overcome before Zhang’s organocatalytic reaction can be applied industrially. According to the team leader, the most pressing challenge is not the scaling up of production or reducing the cost of the catalyst itself, but finding alternatives for the costly hydrosilane substrate. One candidate for this role is hydrogen gas, suggesting the tantalizing possibility of a tie up with other researchers working on splitting water into hydrogen and oxygen using light-activated catalysts. “If we can use the hydrogen to react with carbon dioxide, the whole system would work nicely. That is what we are proposing,” says Zhang.